Unfortunately, acne or spot breakouts are a part of life that most of us have to deal with. Though everyone’s skin is different there are right and wrong ways of dealing with them. 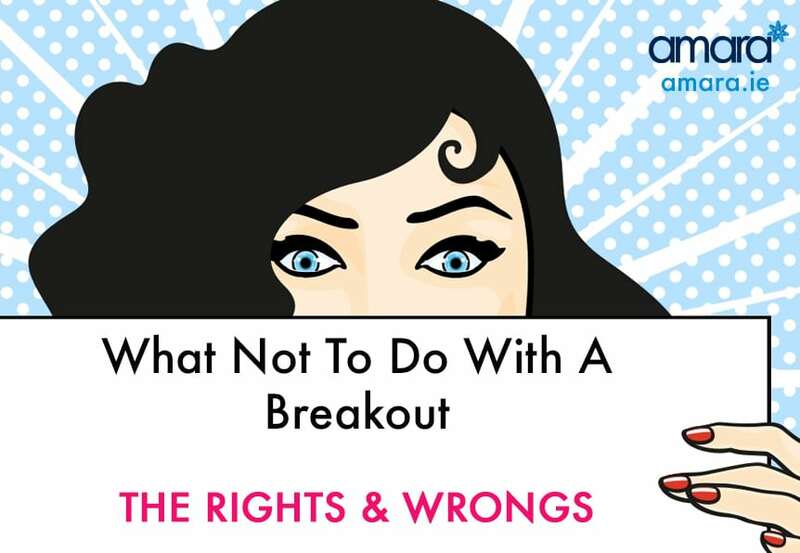 Follow Amaras’ rights and wrongs of dealing with breakouts. Did you get new makeup or new skincare recently? Are there certain foods that make you break out? Many people suffer breakouts from foods such as dairy. – The majority of people who suffer from acne is caused by hormonal. Were you drinking recently? Breakouts that centre round in between the eyebrows are typically caused by alcohol. Finding the cause of your breakout can help you prevent them from happening again. Cheap makeup and products can lead to breakouts as well as the use of face wipes. Bursting or popping your spots. When you see a whitehead most of us have the instinct to pop it. STOP! By popping your spots you are putting yourself at risk of scarring, scabbing and spreading bacteria. If you pop your spot it will not heal efficiently and likely a new spot will appear there very soon as well a cluster of surrounding spots. Some skin health therapists will extract impurities from your skin during treatments, however, they have the knowledge to do it correctly. Using the correct skin care. If you are not already on a targeted skincare routine then it’s time to be! Using skin care that doesn’t suit your skin will only lead to issues down the line. For example products with glycolic will not likely work well with acne skin. It’s important to have the correct strength of ingredients and order of products. With the ZO Skin range typically we start with the basics. Cleanse, oil control, serum and of course SPF. However, there are a number of different cleansers available depending on your skin type. For acne breakouts, salicylic acid is needed to help control and calm down the inflammation overall. Different strengths are available depending on how often and severe your breakouts are. These targeted products are only available after a consultation with a skin health specialist. Using cupboard ingredients to cure it. We don’t know how our skin will react to ingredients we have no control over. Using science-backed products gives you a wealth of information showing you why this should be on your face. What works for someone else may not work for you, all of our skin is unique and depends on our own background. Exfoliating our skin helps regenerate our cells and clear out our pores. Chemical exfoliation with salicylic acid will clear out our pores, blocked pores are what cause spots and blemishes to appear. It is important that when manually exfoliate we are gentle on our skin – too rough and we could damage our capillaries. Use a fine exfoliate such as exfoliating polish or Vita scrub. Not washing your face for long enough. Whether you have a breakout or not you should be washing your face for a minimum of 60 seconds. Any less and you are not giving your cleanser the time to fully remove impurities and makeup. Use lukewarm water to wet your face and then use a bean size amount of cleanser and lather it on your face for 60 seconds or longer. Use lukewarm water to thoroughly wash it off. You should be wearing SPF everyday no matter the condition of your skin. Wearing SPF when having a breakout wearing can prevent darkening of the scars and pigmentation. Other SPF, like smart tone, helps even out the colour of your skin lessening the noticeability of the marks. If you need help with your breakouts or skincare our skin health specialists are here to help. Contact us now for a consultation.